The Big Mill was produced by Templar Film Studios in 1963 and was directed by Laurence Henson. What do you think of as being associated with the decade of the sixties? Is this a surprising representation of life and work then? The sixties was a decade of enormous social change, fashion, fun and ‘rock and roll’. The Big Mill is a sponsored documentary by Colvilles Ltd featuring the production of sheet steel at the Ravenscraig and Gartcosh Works of Colvilles Limited, Lanarkshire. Ravenscraig steel works produced steel in many forms - to make cars and desks, bridges and ships for worldwide markets. The film contains ‘actuality’ footage of a thriving steel industry in and around Motherwell - home of ‘the steel men’ - Motherwell’s Football Club moniker. The film should be seen in the context of the genre of documentary within the films sponsored by the Films of Scotland Committee under the supervision of John Grierson - a key figure in the documentary movement. (See David Griffith's feature resource on John Grierson for more information). The purpose of the Films of Scotland Committee was to promote Scotland both nationally and internationally, depicting all aspects of Scottish life; social, cultural and industrial. What message does the filmmaker want to give about Scottish Steel and what values are associated with this product? How is the audience supposed to react? Explain how the audience is made to feel this way? How is looking at the world through film different from looking at the world through a window in your house or classroom? Provide an opportunity for the dissemination of information and discussion on the sixties as a decade of tremendous change. The war and postwar austerity was over, optimism reigned and an army of consumers would soon see man walk on the moon. The first heart transplant had taken place and the Concorde airplane would fly faster than the speed of sound. It was also the decade of the Cuban Missile Crisis, JFK’s assassination and Vietnam. All areas of art and design were affected and the UK was about to adopt values prevalent in the States a decade earlier and become a throwaway society. Oscar Marzaroli was an assistant cameraman on this film he was also a still photographer of some note. 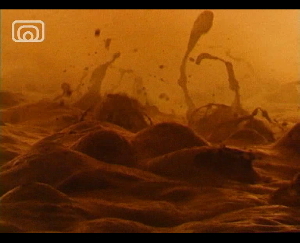 This film is lyrically shot, try to deconstruct the film as a series of shots using the visual elements. Look carefully and consider: composition, tone, shape, pattern, texture, colour, line, form. Looking at and denoting the images in detail and analysing their connotations will help you to read the film in the same way as you might read and interpret the words in a sentence on a page. Following on from Activity 2, research other still photographers. It may be fruitful to look at the work of the Magnum photographers (Global) and the Farm Security Administration (America), Alexander Rodchenko (Russia) etc. The Bauhaus School of Design founded by the architect Walter Gropius believed that all design could be functional and aesthetically pleasing. 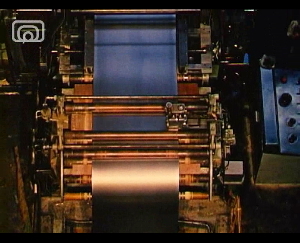 This film shows mass production in operation - a hallmark of the new machine age which began in the early decades of the twentieth century and links with the modernist style which was dominant. Review design movements to this point from the Industrial Revolution, Arts and Crafts, Art Nouveau, Art Deco up to Modernism. What was the song and what were the design group called? Why were they named after the song? Can you name any other sixties' icons? The Pop Art bubble had not yet burst and Andy Warhol with other Pop Artists' was celebrating American consumerism and producing 16mm films. Richard Hamilton and Eduardo Paolozzi were recycling the everyday closer to home. Review Pop Art as a movement and discuss repetitions and patterns in Pop Art with the repetitions and patterns of this film. It may also be worth mentioning America and Hollywood in terms of cinema and London as a centre of a cultural revolution in the arts, fashion and music. Research the work of contemporary Scottish sculptor, David Mach. View his work online and examine/discuss how he uses repetition in his work. View Mark Wallinger’s Sleeper (2004) - a contemporary art video, and explore/discuss what constitutes art. This film could be seen as an advert for Scottish steel perhaps you could produce your own advert for a particular product or service either as a graphic or as a short TV commercial. Lesson guide written by Alex Simpson.